China is rapidly expanding the size and scope of detainment camps in the country’s western region, according to reports, where hundreds of thousands of Muslims are being held in what are described as indoctrination centers. Satellite imagery of the area over the Xinjiang region shows not just 28 separate detention camps - apparently part of a huge Chinese government program to better control the sizeable Muslim population in the area – but continued expansion of those detainment centers. Details of the satellite imagery, released this week, shows the total camp area grew more than 400 percent since 2016. Most of the expansion occurred this year, according to the research by the Australian Strategic Policy Institute, which conducts research for the Australian military. ABC News conducted an investigation into the camps and used the institute’s research. The expansion of the camps coincides with heightened criticism of the indoctrination centers by former detainees and their relatives. International media reports have also stepped up coverage of the issue. Human Rights Watch China Director Sophie Richardson called the images and report a significant addition to the growing body of evidence about the suppression campaign against Muslims. An estimated 14 million Chinese citizens, most of them members of Muslim ethnic groups, live in Xinjiang. Tensions have flared between the Chinese government and the Uighurs, one of China’s most prominent minority groups, who seek to establish greater autonomy. The Chinese government will not say how many people are being detained in the camps. Reports put the number in the hundreds of thousands, while some believe there could be as many as a million being detained. Some relatives of those being held, who can speak freely outside China, say detainees have died in the camps, or shortly after they were let out. Chinese officials have refuted reports of a mass detention system aimed at subjugation, instead saying that the camps were vocational schools that would combat the violence in the area. A Foreign Ministry spokesman refused to comment on the report about the expansion of the camps. The images come as a United Nations panel is scheduled to discuss China’s human rights record in Geneva next week. The topic of the camps has been more intensely discussed in international circles, even before the report of the satellite images. British diplomats went to the Xinjiang area in August and determined reports about the camps were “broadly accurate,” according to a Wall Street Journal report. 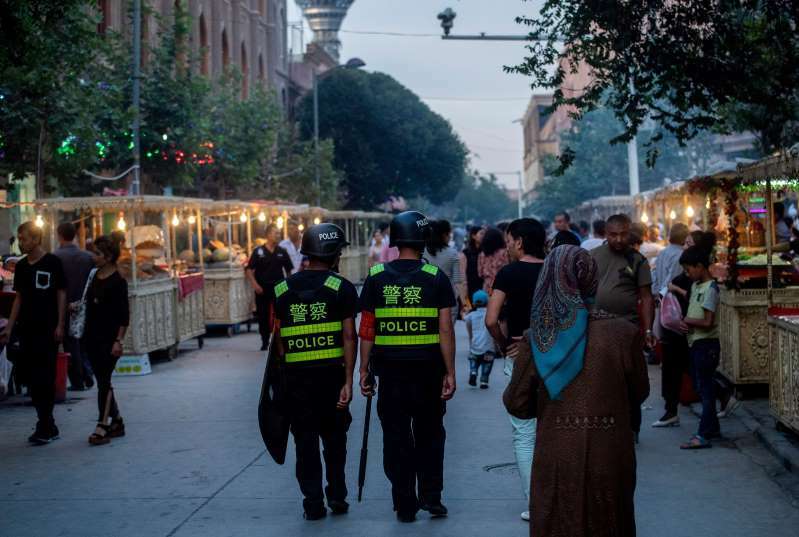 “The Chinese state has changed the facts on the ground in Xinjiang so dramatically that it has allowed little time for other countries to meaningfully react,” said the institute report. The researchers analyzed satellite images, construction-tender documents information from officials, activists others, the Journal said.